Red Hat JBoss Enterprise Application Platform is the leading open source platform for next-generation Java and Java EE applications. It's integrated, simplified, and delivered by the leader in enterprise open source software. Red Hat JBoss EAP 7 enables easier, more agile development. The Arquillian test platform makes it easier to test and offline CLI improves the ability to automate a delivery pipeline. Graceful shutdown allows for rolling deployments. Fully supported integration with the rest of the Red Hat ecosystem, like OpenShift and Red Hat Satellite/CloudForms, makes Red Hat JBoss EAP 7 an ideal platform to use for DevOps. Red Hat JBoss EAP 7 adapts to the type of application used and the available infrastructure. It can power microservices using very little memory and low CPU per instance, as well as a high-performance cluster using terabytes of memory and thousands of cores. Regardless of your deployment architecture, you get the full power of Java EE 7 when using Red Hat JBoss EAP 7. Use Red Hat JBoss EAP 7 on everything from mainframes to cloud and microservices environments. The Web Management Console provides stand-alone server and domain management. The same platform can also be run as a managed instance in a cloud environment using OpenShift. JBoss EAP 7 lets you move from traditional to cloud deployments without having to rewrite applications. Review the JBoss EAP 7.1 Supported Configurations and Installation Prerequisites. Download the JBoss EAP 7.1 ZIP distribution. Extract the JBoss EAP ZIP archive. Review the Getting Started Guide for instructions on starting JBoss EAP. Review the JBoss EAP 7.1 Supported Configurations. Extract the ZIP archive to the server and directory where you want to install the product. JBoss EAP 7.1 has been installed successfully. See the Getting Started Guide for starting and managing JBoss EAP 7.1. You can also get started developing applications quickly by using the JBoss EAP quickstarts. JBoss Enterprise Application Platform 7 is an application server that serves as a middleware platform and is built on open standards and compliant with the Java EE 7 specification. It is based on WildFly 10, but integrates additional features such as high-availability clustering, messaging, distributed caching, and other technologies. JBoss EAP introduces the concept of a managed domain. The managed domain simplifies and centralizes configuration management for multiple servers, as opposed to managing and configuring an individual, or standalone server. 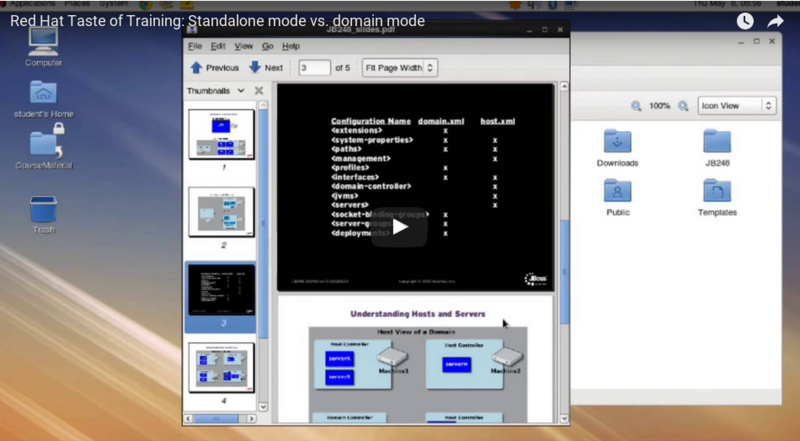 This video provides an overview of the standalone server versus the managed domain approach. JBoss EAP 7 offers a structure of core management security for the server and for the security subsystem for applications. Red Hat JBoss Enterprise Application Platform (JBoss EAP) is available as a containerized xPaaS image that is designed for use with OpenShift. Developers can quickly build, scale, and test applications deployed across hybrid environments. Use Linux Containers with JBoss EAP for open source application packaging and delivery technology, combining lightweight application isolation with the flexibility of image-based deployment methods. All this is meant to provide you with an environment to produce and run enterprise-quality containers.